Christianity is the predominant religion in Austria. At the 2001 census, 73.6% of the country's population was Catholic. As of 2018[update], the number of Catholics has dropped to 56.9% of the population, according to data provided by the Austrian Catholic Church itself. There is a much smaller group of Evangelicals, totalling about 4.7% of the population in 2001, shrunk to 3.3% in 2018. Since 2001, these two historically dominant religious groups in Austria recorded losses in the number of adherents. The Catholic Church reported an absolute drop of 15.7%, the Evangelical Lutheran and Evangelical Reformed churches of 1.3%. In relative numbers the losses of the smaller Evangelical churches account for 33.7%, compared to Catholic losses which account for 21.9%, since their maximum in 1971. In contrast, due to immigration, the number of Muslims in Austria has increased in recent years, with 4.2% of the population calling themselves Muslim in 2001, up to around 5% to 6.2% in 2010, and to 7.9% in 2016 - represented especially by immigrants from Turkey and the Balkans. Eastern Orthodox churches have also grown rapidly (up to 8.8% of the population) in recent years, mainly due to immigration of Serbs from the former Yugoslavia and Romanians. There are also minor communities of Hindus, Sikhs, Buddhists and Jews, and other religions in Austria. Much of eastern Austria adopted Lutheranism until counterreformational efforts changed it in the late 16th century. 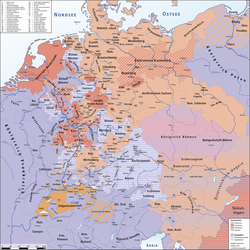 The Protestant Reformation spread from northern Germany to Austria. By the Council of Trent in 1545, almost half of the Austrian population had converted to Lutheranism, while a minority also endorsed Calvinism. Eastern Austria was more affected by this phenomenon than western Austria. After 1545, Austria was recatholicized in the Counter Reformation. The Habsburgs imposed a strict regime to restore the influence of the Catholic Church among Austrians and their campaign proved successful. The Habsburgs for a long time viewed themselves as the vanguard of Catholicism, while all the other Christian confessions and religions were repressed. In 1775, Maria Theresa gave official permission to the Mechitarist Congregation of the Armenian Catholic Church to settle in the Habsburg Empire. In 1781, in the era of Austrian enlightenment, Emperor Joseph II issued a Patent of Tolerance for Austria that allowed other confessions a limited freedom of worship. Religious freedom was declared a constitutional right in Cisleithania after the Austro-Hungarian Ausgleich in 1867 thus paying tribute to the fact that the monarchy was home of numerous religions beside Catholicism such as Greek, Serbian, Romanian, Russian, and Bulgarian Orthodox Christians (Austria neighboured the Ottoman Empire for centuries), both Calvinist and Lutheran Protestants, and Jews. In 1912, after the annexation of Bosnia Hercegovina in 1908, Islam was officially recognised in Austria. Austria was greatly affected by the Protestant Reformation, to a point where a significant part of the population became Protestant. Lutheranism was the most successful Protestant confession; that was the case among other German-speaking populations across the Holy Roman Empire and Austria was indeed one of them. Calvinism did not receive that much support. The prominent position of the Habsburgs in the Counter-Reformation, however, saw Protestantism all but wiped out beginning in 1545, restoring Catholicism as the dominant religion once more. The significant Jewish population (around 200,000 in 1938), mainly residing in Vienna, was reduced to just a couple of thousand through mass emigration in 1938 (more than 2/3 of the Jewish population emigrated from 1938 until 1941), and the following Holocaust during the Nazi period. Immigration in more recent years, primarily from Turkey and the former Yugoslavia, has led to an increased number of Muslims and Serbian Orthodox Christians. As in other European countries, there has been a growth of Pagan movements in Austria in recent years. Letzehof Buddhist Monastery at Feldkirch, in Vorarlberg. St Stephen's Cathedral in Vienna. The Lutheran Christuskirche (Church of Christ) in Salzburg. The Temple of Apollo at Hundstalsee, built by local artists in honour of the Greek god Apollo. Catholicism is the largest religion in Austria, representing 57.9% of the total population in 2017. The Catholic Church's governing body in Austria is the Austrian Conference of Catholic Bishops, made up of the hierarchy of the two archbishops (Wien, Salzburg), the bishops and the abbot of territorial abbey of Wettingen-Mehrerau. Nevertheless, each bishop is independent in his own diocese, answerable only to the Pope. The current president of the Conference of Catholic Bishops is Cardinal Christoph Schönborn. Schönborn belongs to the Central European noble family of Schönborn. Although Austria has no primate, the archbishop of Salzburg is titled Primus Germaniae (Primate of Germany). The organization Call to Disobedience (Aufruf zum Ungehorsam in German) is an Austrian movement mainly composed of dissident Catholic priests which started in 2006. The movement claims the support of the majority of Austrian Catholic priests and favors ordination of women, married and non-celibate priesthood, allowing Holy Communion to remarried divorcees and non-Catholics in contrast to teachings of the Catholic Magisterium. Eastern Orthodox and Oriental Orthodox churches grew over the last decades due to the coming of South Slavic immigrants from the Balkans to Austria. The largest group of Eastern Orthodox in Austria are Serbs. The Vienna Institute of Demography of the Austrian Academy of Sciences estimated in that there were 397,219 Eastern Orthodox Christians in Austria in 2016, representing the 4.6% of the total population. The Protestant Reformation spread from northern Germany to Austria. By the Council of Trent in 1545, almost half of the Austrian population had converted to Lutheranism, while a much smaller minority also endorsed Calvinism. Eastern Austria was more affected by this phenomenon than western Austria. After 1545, Austria was recatholicized in the Counter Reformation. The Habsburgs imposed a strict regime to restore the influence of the Catholic Church among Austrians and their campaign proved successful; the Habsburgs for a long time viewed themselves as the vanguard of Catholicism, while all the other Christian confessions and religions were repressed. Protestantism reached a peak percentage of 6.2% by 1951 for the first time in Austrian history since the success of the Counter-Reformation. Currently, it claims around 3.5% of the population. Austrian Protestants are overwhelmingly Lutheran (3.4%), with a small Reformed community (0.1%). New arriving Protestant churches are growing in membership, especially Evangelical Protestants and Pentecostals, a study from the Vienna Institute of Demography of the Austrian Academy of Sciences found that there were an estimate of 412,423 Protestants of all types in Austria in 2016. The Lutheran Evangelical Church of the Augsburg Confession in Austria has about 300.000 (3.4%) members. The Reformed Church in Austria, a Calvinist body, has roughly 13,590 members. Due to immigration, especially from the Balkans and Turkey, the number of Muslims in Austria has grown exponentially over the latest decades, with an estimated number of Muslims of 686,599, or 7.9% of the total population as of 2010, up from 4.2% in 2001. Buddhism is a legally recognized religion in Austria and it is followed by thousands of people. Although still small in absolute numbers (10,402 at the 2001 census), Buddhism enjoys widespread acceptance in Austria. A majority of Buddhists in the country are Austrian nationals (some of them naturalized after immigration from Asia, predominantly from China and Vietnam), while a considerable number of them are foreign nationals. As in most European countries, different branches and schools of Buddhism are represented by groups of varying sizes. Vienna not only has the largest number of foreign residents, but is also the place with the longest tradition of Buddhism in the country. Most of Austria's Buddhist temples and centres of practice can be found there; some with a specific Chinese, Vietnamese, Tibetan or Japanese appearance. The latest development has been the establishment of a "Buddhist cemetery" around a stupa-like building for funeral ceremonies at the Vienna Central Cemetery. Austria has seen a growth of Pagan movements in recent years, especially Druidic (Druidentum), but also Germanic Heathen (Heidentum), Wiccan and Witchcraft (Hexentum) groups. As of 2010 Austrian motorway authorities have been hiring Druids for geomantic works intended to reduce the number of accidents on the worst stretches of Austrian speedways. Celtic Neopaganism and Neo-Druids are particularly popular in Austria, by virtue of Austria being the location of the proto-Celtic Hallstatt culture. The Keltendorf in Diex, Kärnten combines archaeological reconstruction with "European geomancy". The Europäische Keltische Gemeinschaft has been active since 1998. In 1910, 93,7% of the Austrian population was Catholic, 3,1% was Protestant, 2,9% was Jewish, 0,3% was placed in other religious categories. Since the second half of the 20th century, the number of churchgoers and people identifying as Catholics and Protestants has dropped (cf. tables). 44% of Austrian citizens responded "they believe there is a God". 38% answered "they believe there is some sort of spirit or life force". 12% answered "they do not believe there is any sort of spirit, God, or life force". ^ a b WZ-Recherche 2016. Published in article: "Staat und Religion". Wiener Zeitung, January 2016. ^ "Anzahl der Gläubigen von Religionen in Österreich im Zeitraum 2012 bis 2017". Statista – Das Statistik-Portal. ^ a b "In Österreich leben mehr Orthodoxe als Muslime". 13 September 2018. Retrieved 7 November 2018. ^ a b "Zahlen und Fakten" [Numbers and Facts]. Evangelical Church in Austria. 31 December 2010. Retrieved 19 January 2016. ^ "How many Muslims live in Austria?". euro-islam.info. 9 February 2010. Retrieved 19 January 2016. ^ a b Mathias Vogl; Alexander Janda, eds. (2010). "Islam in Österreich" [Islam in Austria] (PDF). Österreichischer Integrationsfonds (in German). Archived from the original (PDF) on 4 March 2014. ^ a b c d e Goujon, Anne; Jurasszovich, Sandra; Potančoková, Michaela (August 2017). "Religious denominations in Austria" (PDF). Vienna Institute of Demography of the Austrian Academy of Sciences: 102. ^ "Religion in Austria on CIA World Factbook". Retrieved April 21, 2007. ^ a b "Religion in Austria on Sacred Destinations". Archived from the original on 2006-05-23. Retrieved April 21, 2007. ^ "Religionsbekenntnis". AEIOU. Retrieved 22 May 2009. ^ Druids cut death toll with divine intervention. The Telegraph. ^ Motorway druids tackle road accidents. Austrian Times. ^ "Bevölkerung nach dem Religionsbekenntnis und Bundesländern 1951 bis 2001" [Population by religious denomination and Federal State from 1951 to 2001] (PDF) (in German). Statistical Office of Austria. 1 June 2007. Retrieved 19 January 2016. ^ "Katholische Kirche Österreich: Statistik" [Catholic Church Austria: Statistics] (in German). Katholisch.at. Archived from the original on 2013-03-14. Retrieved 12 February 2017. ^ "Statistical Data 2001–2016" (in German). Evang.at. 12 February 2016. Retrieved 12 February 2016. ^ "Special Eurobarometer 73.1: Biotechnology Report" (PDF). European Commission. October 2010. p. 383. Archived from the original (PDF) on 15 December 2010.